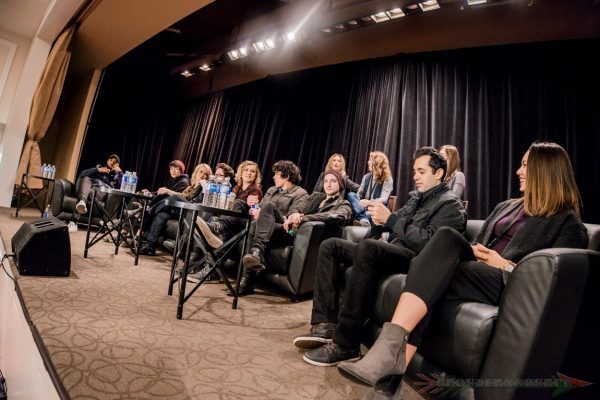 The weekend was truly a memorable one as fans and cast from all around the globe came to Unity Days 2017 to celebrate The 100 as a whole. I cannot even begin on describing the positivity and love that it brought. For me, it was a journey to find myself and to realize that life can be spectacular, even in the darkest corners. It was an event that would be “#UnitedForever. First and foremost, I am thanking Miah Bannerman and Leana Santos, the founders of Unity Events for creating such an amazing experience. Secondly, The 100 cast are such an incredible bunch of people who took time out of their very busy schedules to come out to hang with everyone. I am not going to say who was the nicest because they all were, and it wouldn’t be right. Yeah, I am not the person who can compare and contrast people in that retrospect. as duplicates. Not the truth. I will be honest, I was a little nervous whilst in the registration lines because I am not too good on crowds. Partly due because I got a lot of harassment and hate growing up as a disabled person, something that I had no control over, and personal choice of keeping a wall up. But like a magical wind, it quickly dissipated, and I outreached and opened up to people. It was phenomenal and awesome. I believe it was like that for everyone, the cast included. It was such an accepting, loving, and unifying experience and that is something that is quite rare. There is usually a lot of drama and sometimes a bit of conflict at conventions. This is usually based on fandom preferences on characters and ships, and take it out on a whole different level. And most unfortunately, not for the better. There was zero of that behavior. In fact, there was zero negative behavior. Another thing made this convention so wonderful and personable was that people were making donations to Cancer Gets Lost, a nonprofit organization founded by Jo Garfien and her wife Lisa. Nearly $5K was raised from people bidding in the silent auction on Friday evening on The 100 themed fanart for cancer. Plus, additional signed pieces were donated for future auctions. Now that is inspirational! If you could not make Unity Days, don’t fret. You can still get a piece of it by winning on a book signed by the cast, with the net profits going to the Special Olympics International. More information on this charity proposition will be coming in the near future. If you can not be able to bid on the book, you can still help by sharing it on social media and word of mouth. The more recognition that it gets, the more it will be successful. Everything that was planned and unplanned was wonderful, and it was the best. Photos from both myself and Unity Events will be in the gallery soon. Non-descript spoilers (You really think I’d give major ones? I’d like them to stay employed.) Plus, Warner Brothers and the network will not think fondly of me. I have realized that running and writing Grounders Source is one of my deepest passions, and I love every moment of it. So thank you for visiting and loving it as much as I do. Your support means the world. Who would have thought that a television show can unite people together? To create a better world, and to visualize a life with hope? ??? Thank you for letting me into your life, and I hope that you will achieve your dreams and aspirations to the fullest. I want to know that no matter how dark life will get, the moments will pass, and you’ll become a stronger individual. The world needs you, and life will not be the same without you. Keep that in mind, loves. Please visit Unity Events Canada for more on United Days. Photos in this post are by Jerry Jin.